By Laura - Malaysia - 23 Nov/03 - Viewed 3787 times. After finishing the climb down we decided to try and get to Sepilok that day. To get there you can catch any bus heading to Sandakan. There was supposed to be one at 4pm so we started waiting on the road outside the National Park half an hour before then. At about 4:15pm one drove past but the driver gave us a funny wave, which we later found out meant it was full. Another bus followed 5 minutes later but that one was also full. We waited a little bit longer but decided that it was unlikely that there would be another bus that day. We could have stayed in the park another night but thought we'd have a better chance of catching a bus the following day if we went to Ranau. The taxi to Ranau cost RM40.00 and after finding out that two of the hotels in our guidebook are now closed we were dropped off at the Rafflesia Inn. We treated ourselves with an air-con double room for RM55.00 and the people at reception were very friendly. Ranau is a small town that doesn't normally see many tourists. We went to eat at a local Chinese restaurant just round the corner from the hotel. Fortunately one person spoke good English and ordered our meals for us. Everyone there was very friendly and keen to practise their English. Afterwards we were invited onto their table and Mark chatted to an older guy for ages, while I was shattered after getting up at 2am and had to go to bed. The guy kept buying Mark beers and refused to let him pay for any. He just wanted someone to talk English to. The meal for two cost just RM12.00. The next morning we had a look around Ranau. We were able to get some cash out of an ATM and stock up on some food for our trip to the jungle. As we were walking round we were heckled by the workers on a building site who were shouting "Good Morning" and "Bye bye". At just after 10am we started waiting for a bus to Sandakan. Over an hour later and still no bus had appeared, not even a full one. We saw plently of buses heading to Kota Kinabalu though. There seems to be a weird phenomenon in Sabah where there are hundreds of buses heading from Sandakan to Kota Kinabalu but none going in the other direction. Just as we were starting to worry a minibus heading in our direction pulled over. It looked full but after rearranging some of the people already in it we were able to squeeze in. The journey took about three hours and cost RM20.00 each. We managed to get the driver to drop us off at the Sepilok Resthouse, otherwise it is a 2.5km walk from the main road. The Sepilok Resthouse is a lovely relaxing place to stay and is conveniently located next to the Orangutan Rehabilitation Centre. A double room with fan cost RM45.00 including breakfast and they also have dorm beds for RM18.00. We arrived after 3pm so thought it was too late to see the orangutans. We knew the Rugby World Cup Final was on that day and were hoping that we might be able to watch it. It turned out that we had chosen the best place in the area to watch it. Just as it started there was a powercut but fortunately the resthouse had a generator and soon it was back on again. There were a few other English people there and a bit later some Australians from a hotel with no generator came over. It was an exciting game and a big relief when England won. After the match dinner was served. You order from the menu earlier in the day and then everyone eats together. We stayed up late chatting to everyone. The next morning we got up early to go and see the orangutans. The first feeding time is at 10am but they show a video at about 8:40am. 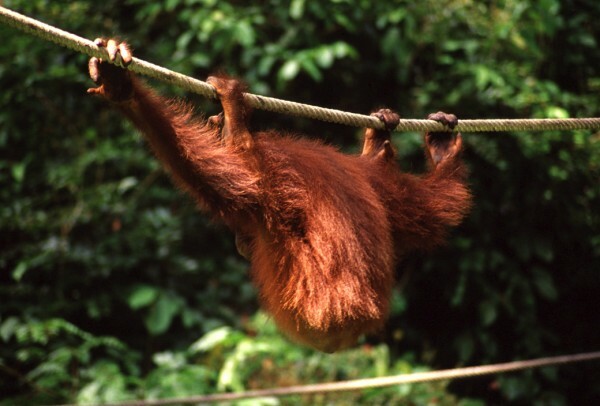 It is worth watching and shows the rehabilitation process right from when the orangutans first arrive. After that we walked to the viewing platforms. The entrance ticket costs RM30.00 plus RM10.00 for a camera. This covers entry for both feeding session on the same day. The walk takes about five minutes and was a bit of a struggle as I still couldn't walk properly after the climb. When we got there the platforms were very busy. The orangutans arrived about half an hour early for the feeding, and there was five or six of them playing around. After they were fed they only stayed around for 10 minutes before they all disappeared. Most of the people had disappeared by this time as well. We waited around for a few more minutes but none of the orangutans returned. The second visit was much better (More Orangutans).